The internet wasn’t built by money-hungry American corporations and Silicon Valley startups. It was built by a worldwide community of government researchers and academics who were primarily interested in spreading the benefits of computer networking to as many people as possible. It was built by men and women like Tan Tin Wee. Tan Tin Wee is a molecular biologist in the medical school at the National University of Singapore, and that’s been the case for more than 20 years. But when he first arrived at the University in the early ’90s, he tapped the internet as a way of facilitating his biochemistry research, and he quickly developed a shadow career working to bring the net to the rest of Singapore — and so many other parts of Asia. Over the next 20 years, even as he was building an academic career in biochemistry, Tan oversaw Singapore’s first internet service provider. He helped launch the first websites aimed at Chinese and Tamil speakers. And he spearheaded the creation of an internet domain naming system that would allow online addresses to accommodate more than just the Latin characters used in English speaking countries. In recognition of this work, the Internet Society (ISOC) included Tan in its inaugural class of inductees into the Internet Hall of Fame, placing him alongside such names as Sir Tim Berners-Lee, Vint Cerf, and Leonard Kleinrock. Like so many other internet pioneers — including, say, MIT political scientist John Klensin — Tan Tin Wee wasn’t trained as a computer engineer. 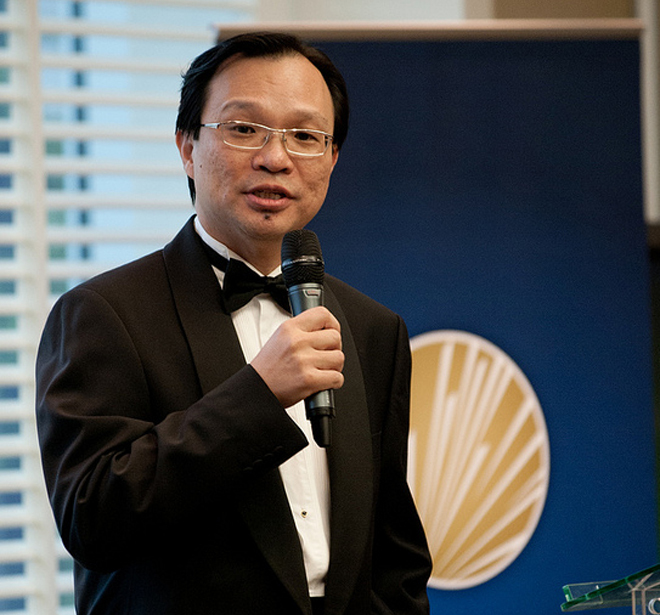 He studied the natural sciences at Cambridge University and the University of College, London and completed a biochemistry Ph.D. in Edinburgh, Scotland, before returning to Singapore, where his family had immigrated from mainland China at the turn of the Twentieth Century. He took a full-time position in the medical school at the National University, and though the University couldn’t provide the sort of computing infrastructure he’d grown accustomed to back in Britain, it did offer a connection to the internet through BITNET, an academic network that began in the States. Soon, he was using more internet bandwidth than almost anyone in the Singapore, taking advantage of things like email, online newsgroups, and FTP — the file transfer protocol that could be used to move larger amounts of data across the globe — while tapping into various bioinformatics databases set up in other parts of the world. By the end of 1993, Tan was helping the Singapore telco, Singtel, provide internet access to the rest of the country — not just the academic community — and after this commercial operation recruited the man running Tech Net at the University, Tan was asked to fill the void. “I was running immunochemistry laboratories in the morning, and then running upstairs to the computer center and the Tech Net unit in the afternoons,” he says. In fashioning internet services for those in Singapore, Tan and his colleagues were forced to find ways of dealing with multiple languages — including some that used more than just Latin characters. Singapore has four national languages — Malais, English, Chinese, and Tamil, a language that originated in south India and Sri Lanka. At first, they found ways of displaying Chinese and Tamil characters inside a web browser. But later, Tan helped build the world’s first internationalized domain name system. An internationalized domain name standard was officially published in 2003, and it was later adopted by some top-level internet domains. But it took an awfully long time, and Tan says we’re still a long way from an internet that lives up to the egalitarian vision that drove him and so many others who bootstrapped the network in earlier decades. In the late '90s, you see, those money-hungry American corporations and Silicon Valley startups pushed onto the network — in a very big way. Written by Wired's Cade Metz, this article is the twenty-eighth piece in an ongoing series by Wired magazine on the 2012 Internet Hall of Fame inductees.